This notebook describes the analysis of a snapshot of all replicas in the CMIP5 archive on February 6th 2013. 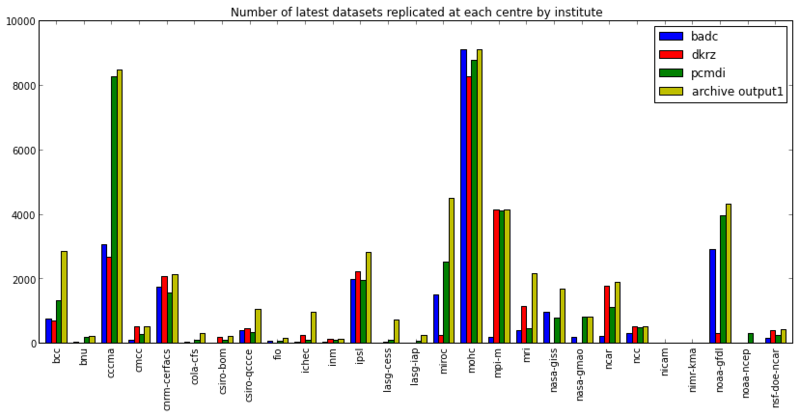 A list of all dataset versions at each of the 3 replicating data centres is read, analysed and compared with the total number of datasets listed in the CMIP5 archive. Dataset: A unit of data published into the system. Dataset Version: A particular version of a dataset. Each dataset version has a datestamp and datasets can be updated by publishing new dataset versions. Latest dataset: The dataset version which is the most up to date of a particular dataset. the institute. Account for some naming anomalies. 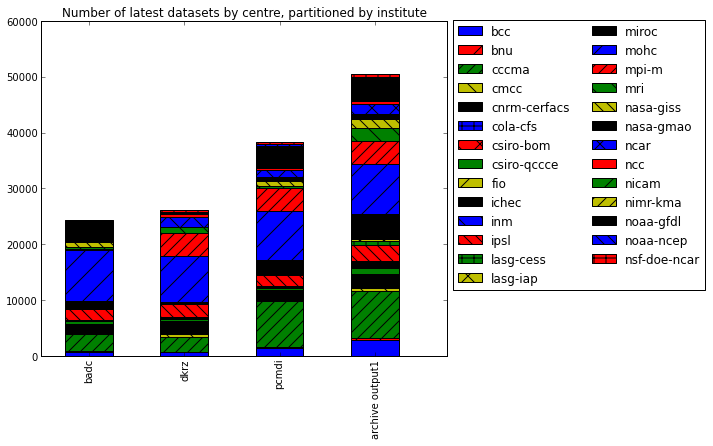 # MOHC output1 dataset versions held at BADC. We plot the venn diagrams showing the intersection of datasets, dataset versions and latest datasets at each centre. We now add the counts of all non-replicas in the archive by querying the ESGF Search API. That no replicated latest dataset has been deprecated by a subsequent version. This is unlikely to be the case as some updates to datasets have almost certainly not been replicated. That no dataset exists only as a replica. I.e. that no dataset has been replicated and then it's original removed.